Are you an ardent fan of online games? Want to join Captain James Hook? Captain Hook has been seeking revenge on Peter for cutting off his hand and feeding it to a giant crocodile? 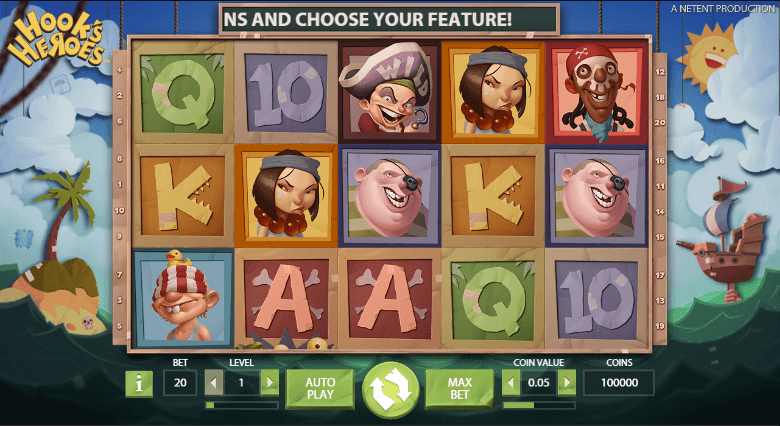 Hook’s Heroes is one of the more recent exciting slots of NetEnt which focuses on Captain Hook’s crew of pirates. The nice thing with NetEnt slots is that they have different settings that can be adjusted to make playing more to your liking. NetEnt have also been creative in bringing out a playing panel with all the usual adventure at sea graphics such as the sea, palm trees while having Caribbean style music playing. What appeals to players with this brand new slot game is that there are 3 different free spins bonus features, and when you spin in 4 or 5 scatter symbols, Lady Luck winks at you, inviting you to play off up to all three of those free spins options. You could not have asked for more. Hook’s Heroes is a 5-reel, 20-payline video slot where players will be able to bet anything from a minimum of 0.20 per spin, up to a high of 200.00 per spin. 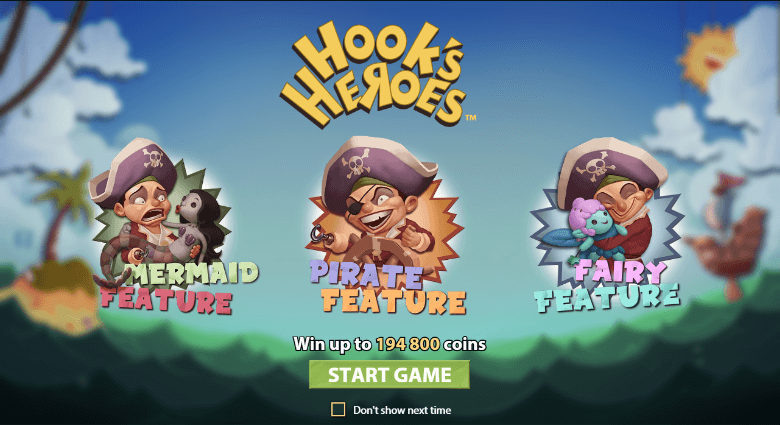 The game has stunning , vivid graphics which are more realistic than previous pirate-themed slots, and when it comes to pay-outs, Hook’s Heroes carries a pay-rate of 96.82 per cent. With one to twenty optional paylines as well as coin values starting at 0.01 which can be increased up to 1.00 as well as the fact that you can play 10 coins per payline, the stake values vary between a mere 0.01 per spin and a high rolling 200.00 per spin. Jackpot Payout – Just like with any slot game, its the jackpot payout which is of huge interest. Payouts in Hook’s Heroes are made according to the Paytable. If you line up 5 Pirate One symbols you are guaranteed 900x your stake per line. There is a potential maximum bonus game jackpot on offer of some 194,800 coins. Multiple Bonus Features – When it comes to bonuses, this slot games offer you plenty. There are more than enough bonus games and bonus features with this game. An exciting feature is the Free Spins. You’ll need at least 3 of the scatter symbols spinning in to trigger the main bonus features. You’ll get 3 options to play off a set of free spins, with each of the spins having their own levels of risk attached to them. When you spin in 4 scatters you can pick 2 or 3 different ways of playing off your free spins. When all 5 scatters make an appearance you can play off up to all three of the free spin options. With the Mermaid Feature for instance you will be able to play off a set of 10 free spins when you have opted to make use of them. The Fairy feature will award 7 free spins and the Pirate feature award a massive 25 free spin. Well, there are a number of online casinos offering you the game but it is strongly recommended that you try the game at Vegas Paradise and Jackpot Paradise. This is because these online casinos don’ t only provide quality entertainment, you get exhilarating fun in a regulated, secure online gaming environment. Licensed and regulated, VegasParadise for instance as well as Jackpot Paradise make use of the latest 128-bit Secure Socket Layer (SSL) encryption and firewall technology. This guarantees all sensitive data is transferred securely over the Internet to protected servers. All online credit card processing is handled secure online transactions and fraud protection and 24/7 customer support. At Vegas Paradise, they offer a match bonus of up to $200 on your first deposit as well as 100 free spins, and Jackpot Paradise, with your first deposit, will give you a 100 per cent match of up to $200. Start playing with them and enjoy 100 free spins and the chance to win double. Trust NetEnt to bring out another fun-filled mobile slot, and this time there is so much more added in, giving you the chance to choose between 3 different Free Spins features while also available as Feature Spins.